For more than a decade, innovative farmers like you have inspired us to do things differently and do things right to defend the land. That’s why the ETS SoilWarrior® tillage equipment line is customizable and built to last. The SoilWarrior combines the speed, power, and deep soil manipulation of conventional tillage with the economic and environmental advantages of conservation tillage to improve farm and agricultural land soil health. It takes the guesswork out of running traditional strip tillage equipment so that you can concentrate on the job ahead. Because feeding the world is an important job that demands determination, not distractions. 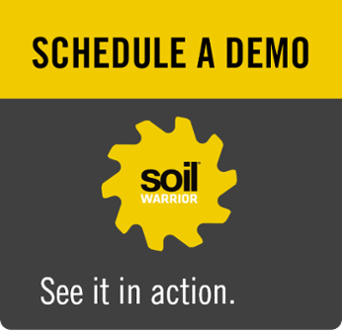 SoilWarrior lets you start your tillage sooner and produce superior seed zones without smearing or shearing the soil structure. Plant earlier without negative effects on root development. And SoilWarrior’s consistent zones make it easy for the planter to stay within the zones, even on side hills. Bring precise control to your fields and increase yield potential with rugged parallel arm linkage and a heavy-duty air spring design for adjustable down pressure. SoilWarrior Row Units handle some of the toughest zone building conditions. 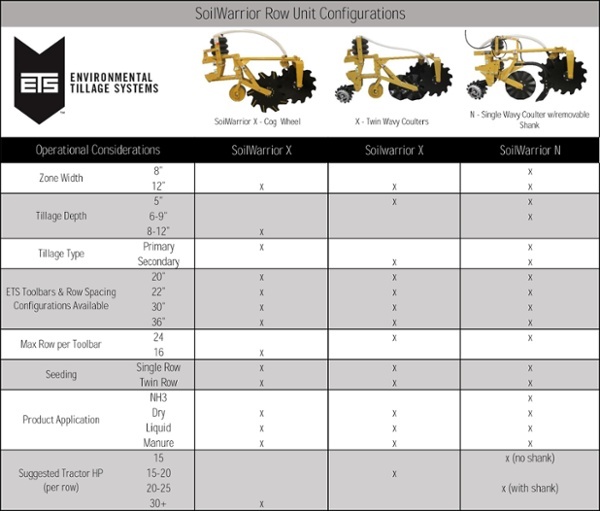 SoilWarrior is configured for your farm, with row units matched to your specific tillage needs. Your configuration is determined by the following criteria: desired tillage depth, desired in-field working width, planter set up, desired spring and fall fertilizer application, precision guidance system, implement steering usage. Click here or on chart below for a list of specs including tractor horse power recommendations.